Creativity, Inspiration and Innovation Seminar. - UVANU INTERNATIONAL | Recruiter Agency, Study in Canada, Vancouver. You are here: Home / Blog / Events / Creativity, Inspiration and Innovation Seminar. 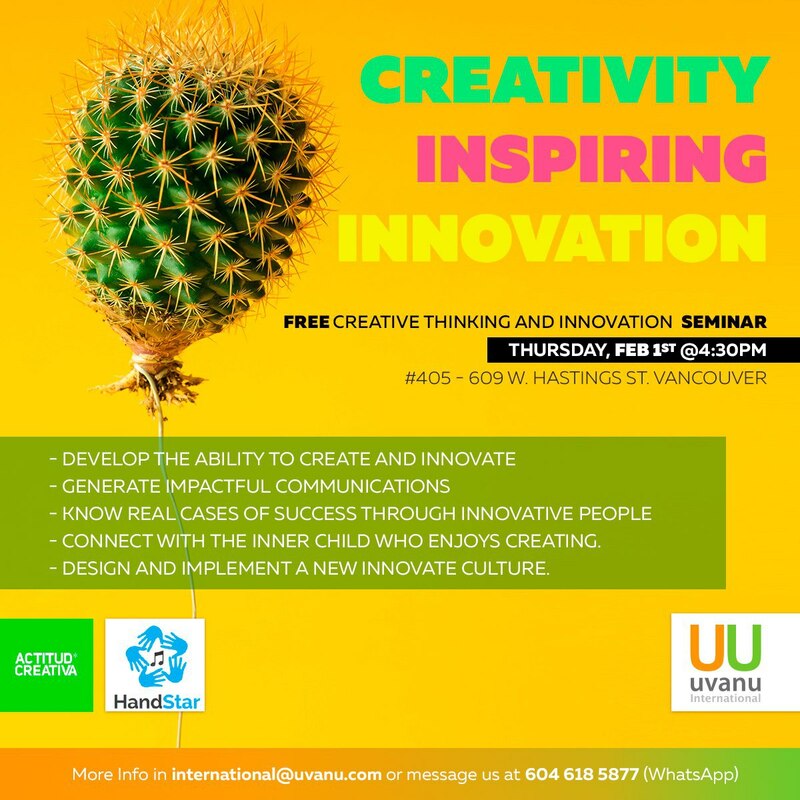 This event will be held at the Uvanu International facilities next Thursday, February 1 at 4:30 p.m.
ActitudCreativa is the leading Spanish consultancy in training on Creative Thinking. Its vision is to use innovation and creativity to solve problems, achieving extraordinary results and adding value to companies. This institution believes that “nowadays we’re living in an increasingly competitive globalized world, in which in order to successfully face the new challenges of organizations, we need to innovate”. This seminar will focus on the development of creative thinking, innovation and inspiration skills. For this, Diego Ruiz will use different techniques that will help to expand the creative vision through different exercises. Diego Ruiz is an entrepreneur. He received the national prize “Elevator Pitch” thanks to the HANDSTAR method that he shares with schools and organizations around the world. This method focuses on communication through body and hands expression. This method helps you to lose your shyness in front of public, awake and develop your senses, be “catchy” in job interviews or be a better communicator when selling products of your company. Study of international success stories in terms of innovation and creativity. How to generate impactful communications inside and outside the organization. Examples of real success stories through innovative people around the world. The speaker will also help you to know how to connect with the inner child that enjoys creating. How to design and implement a new innovative culture. “We are very fortunate to live a change of era and, like all species, we need to adapt to survive. Our best tools, creativity and innovation, make our ideas R-EVOLUTION constant. “CreativeAttitude. Don’t forget! Thursday at 4.30 pm!! See you!